The activity is held approximately monthly at the Johns Hopkins Bayview Medical Center in Baltimore, Maryland, in a multimedia classroom constructed specifically for the learner’s needs. This is a workstation-based training activity, designed to meet American College of Cardiology/ American Heart Association requirements. Each participant has their own workstation to use throughout the activity and receives personal attention and instruction by the activity faculty. Instructors to demonstrate various aspects of CT interpretation use a workstation, which projects to the front of the room. After receiving training on the use of the workstation, a library of cases selected to demonstrate the variety of pathology, which can be evaluated by CT (coronary disease, bypass grafts, stents, anomalies, cardiomyopathies, EP, pericardial disease, cardiac tumors), is reviewed. A minimum of 100 cases are reviewed during the five days of the activity. 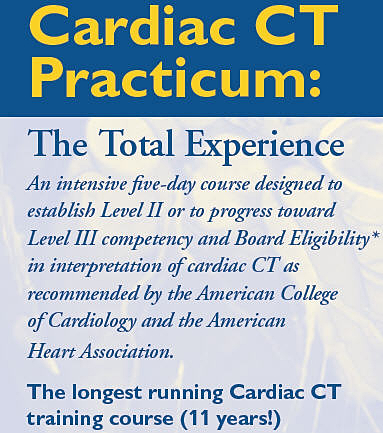 Twenty-four hours of didactic instruction are included through lectures and reading materials, which will cover topics of patient selection, preparation, radiation, contrast, cardiac anatomy, assessment of cardiac function, cardiac pathology, etc. Members of the Johns Hopkins faculty and guest faculty will present these topics. Participants will take a quiz to confirm understanding of these materials. The requirement for observation of the acquisition of 50 studies is satisfied by utilizing a combination of onsite observation of approximately 25 studies supplemented by interactive observation of approximately 25 studies performed offsite and viewed by interactive video link. Participants will have the opportunity to ask questions during acquisition of the studies (i.e., patient selection, use of beta-blockers) and to observe the steps in obtaining the scan by direct observation of the scanner console. The scans that were acquired during the week of the activity are anonymized and participants will interpret these studies on their own time following the five days of onsite training. After faculty review of the participants’ interpretation of these 50 studies and the other elements of the activity, a certificate documenting completion of these studies will be issued. Choose patients appropriate for this imaging modality. Prepare patients to obtain optimal study results. Optimize image reconstruction for cardiac analyses. Use 3D workstation to visualize all aspects of cardiac anatomy. Assess extent of coronary atherosclerosis and evaluate LV function.